Definition at line 1549 of file ketypes.h. Definition at line 1918 of file ketypes.h. Definition at line 1920 of file ketypes.h. Definition at line 1902 of file ketypes.h. Definition at line 1932 of file ketypes.h. Definition at line 1903 of file ketypes.h. Definition at line 1819 of file ketypes.h. Definition at line 1818 of file ketypes.h. Definition at line 1828 of file ketypes.h. Referenced by KdbpCmdThread(), KeRevertToUserAffinityThread(), KeSetSystemAffinityThread(), and NtQueryInformationThread(). Definition at line 1831 of file ketypes.h. Definition at line 1824 of file ketypes.h. Definition at line 1588 of file ketypes.h. Definition at line 1570 of file ketypes.h. Definition at line 1617 of file ketypes.h. Definition at line 1593 of file ketypes.h. Definition at line 1601 of file ketypes.h. Referenced by KeFreezeAllThreads(), and PspExitThread(). Definition at line 1668 of file ketypes.h. 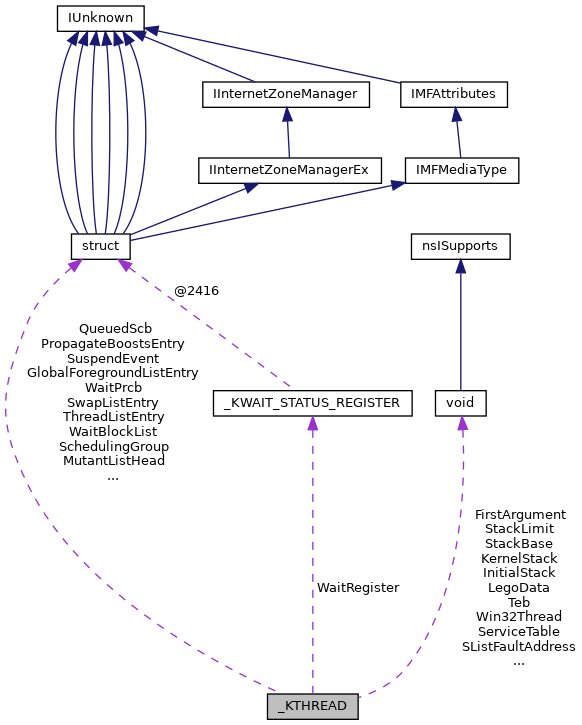 Referenced by FirstSendHandler(), KeFreezeAllThreads(), KeThawAllThreads(), KeUpdateRunTime(), KiInitializeSystem(), KiInterruptDispatch3(), KiSwapContextExit(), KiSystemStartup(), KiSystemStartupReal(), MmArmAccessFault(), NtQueryInformationJobObject(), PspExitNormalApc(), PspExitThread(), and PspWriteTebImpersonationInfo(). Definition at line 1671 of file ketypes.h. Definition at line 1832 of file ketypes.h. Referenced by KiUserModeCallout(), and PspExitThread(). Definition at line 1614 of file ketypes.h. Definition at line 1579 of file ketypes.h. Definition at line 1807 of file ketypes.h. Definition at line 1892 of file ketypes.h. Definition at line 1599 of file ketypes.h. Definition at line 1622 of file ketypes.h. Definition at line 1773 of file ketypes.h. Referenced by ExpWorkerThreadEntryPoint(), KiUserModeCallout(), and PspExitThread(). Definition at line 1638 of file ketypes.h. Definition at line 1678 of file ketypes.h. Referenced by KiSwapContextExit(), and QSI_DEF(). Definition at line 1563 of file ketypes.h. Definition at line 1558 of file ketypes.h. Definition at line 1623 of file ketypes.h. Definition at line 1796 of file ketypes.h. Referenced by KeSignalGateBoostPriority(), and KiDeferredReadyThread(). Definition at line 1615 of file ketypes.h. Definition at line 1621 of file ketypes.h. Definition at line 1604 of file ketypes.h. Definition at line 1619 of file ketypes.h. Definition at line 1642 of file ketypes.h. Definition at line 1564 of file ketypes.h. Definition at line 1626 of file ketypes.h. Definition at line 1654 of file ketypes.h. Definition at line 1663 of file ketypes.h. Definition at line 1625 of file ketypes.h. Definition at line 1813 of file ketypes.h. Definition at line 1941 of file ketypes.h. Definition at line 1935 of file ketypes.h. Definition at line 1627 of file ketypes.h. Referenced by KeFreezeAllThreads(), KeThawAllThreads(), and PsGetThreadFreezeCount(). Definition at line 1938 of file ketypes.h. Definition at line 1620 of file ketypes.h. Definition at line 1551 of file ketypes.h. Referenced by KeFreezeAllThreads(), KeThawAllThreads(), NtCallbackReturn(), PsLookupProcessThreadByCid(), and PsLookupThreadByThreadId(). Definition at line 1560 of file ketypes.h. Definition at line 1834 of file ketypes.h. Referenced by KeRevertToUserAffinityThread(), KeSetSystemAffinityThread(), NtSetInformationThread(), and PspUserThreadStartup(). Definition at line 1942 of file ketypes.h. Definition at line 1554 of file ketypes.h. Referenced by KdbpCmdThread(), KdbpInternalEnter(), KiSwapContextExit(), KiUserModeCallout(), NtCallbackReturn(), PspDeleteThread(), PspReapRoutine(), thread_to_reg(), and VdmpStartExecution(). Definition at line 1915 of file ketypes.h. Definition at line 1924 of file ketypes.h. Definition at line 1770 of file ketypes.h. Definition at line 1565 of file ketypes.h. Referenced by GspGetRegisters(), KdbpAttachToThread(), KdbpCmdThread(), KdbpInternalEnter(), KiSwapContextEntry(), and thread_to_reg(). Definition at line 1877 of file ketypes.h. Referenced by KeUpdateRunTime(), NtQueryInformationThread(), and QSI_DEF(). Definition at line 1887 of file ketypes.h. Definition at line 1913 of file ketypes.h. Definition at line 1607 of file ketypes.h. Definition at line 1899 of file ketypes.h. Definition at line 1795 of file ketypes.h. Definition at line 1958 of file ketypes.h. Referenced by KdbpCmdThread(), KiFlushNPXState(), KiSwapContextEntry(), and KiTrap07Handler(). Definition at line 1817 of file ketypes.h. Definition at line 1806 of file ketypes.h. Definition at line 1672 of file ketypes.h. Referenced by KdbpCmdThread(), KiDeferredReadyThread(), NtQueryInformationThread(), and QSI_DEF(). Definition at line 1810 of file ketypes.h. Definition at line 1916 of file ketypes.h. Definition at line 1917 of file ketypes.h. Definition at line 1798 of file ketypes.h. Referenced by handle_gdb_query(), handle_gdb_read_mem(), and handle_gdb_write_mem(). Definition at line 1598 of file ketypes.h. Definition at line 1585 of file ketypes.h. Definition at line 1639 of file ketypes.h. Definition at line 1914 of file ketypes.h. Definition at line 1618 of file ketypes.h. Definition at line 1594 of file ketypes.h. Definition at line 1872 of file ketypes.h. Definition at line 1553 of file ketypes.h. Definition at line 1696 of file ketypes.h. Definition at line 1624 of file ketypes.h. Definition at line 1956 of file ketypes.h. Definition at line 1782 of file ketypes.h. Definition at line 1581 of file ketypes.h. Definition at line 1699 of file ketypes.h. Definition at line 1605 of file ketypes.h. Definition at line 1602 of file ketypes.h. Definition at line 1867 of file ketypes.h. Definition at line 1569 of file ketypes.h. Definition at line 1856 of file ketypes.h. Definition at line 1850 of file ketypes.h. Definition at line 1853 of file ketypes.h. Definition at line 1600 of file ketypes.h. Definition at line 1863 of file ketypes.h. Definition at line 1866 of file ketypes.h. Definition at line 1871 of file ketypes.h. Definition at line 1876 of file ketypes.h. Definition at line 1886 of file ketypes.h. Definition at line 1891 of file ketypes.h. Definition at line 1567 of file ketypes.h. Definition at line 1561 of file ketypes.h. Definition at line 1552 of file ketypes.h. Definition at line 1857 of file ketypes.h. Definition at line 1655 of file ketypes.h. Definition at line 1681 of file ketypes.h. Definition at line 1842 of file ketypes.h. Definition at line 1904 of file ketypes.h. Definition at line 1771 of file ketypes.h. Definition at line 1556 of file ketypes.h. Referenced by KdbpCmdThread(), KdbpInternalEnter(), PspDeleteThread(), and PspReapRoutine(). Definition at line 1555 of file ketypes.h. Referenced by KdbpCmdThread(), KdbpInternalEnter(), and KiUserModeCallout(). Definition at line 1679 of file ketypes.h. Referenced by GspGetRegisters(), KdbpCmdThread(), KeRevertToUserAffinityThread(), KeSetSystemAffinityThread(), KeSignalGateBoostPriority(), KiAdjustQuantumThread(), KiDecrementerTrap(), KiDeferredReadyThread(), KiDispatchInterrupt(), KiDpcInterruptHandler(), KiExitDispatcher(), KiIdleLoop(), KiQuantumEnd(), KiSetPriorityThread(), KiSwapThread(), NtYieldExecution(), and QSI_DEF(). Definition at line 1566 of file ketypes.h. Definition at line 1881 of file ketypes.h. Definition at line 1855 of file ketypes.h. Referenced by KeFreezeAllThreads(), and KeThawAllThreads(). Definition at line 1897 of file ketypes.h. Definition at line 1694 of file ketypes.h. Definition at line 1587 of file ketypes.h. Referenced by KeRevertToUserAffinityThread(), and KeSetSystemAffinityThread(). Definition at line 1659 of file ketypes.h. Definition at line 1652 of file ketypes.h. Definition at line 1597 of file ketypes.h. Definition at line 1651 of file ketypes.h. Definition at line 1697 of file ketypes.h. Referenced by DbgkCreateThread(), KiSwapContextExit(), MiCheckForUserStackOverflow(), NtQueryInformationThread(), NtSetInformationThread(), PsGetThreadTeb(), PspCreateProcess(), PspExitThread(), PspWriteTebImpersonationInfo(), and RtlWalkFrameChain(). Definition at line 1746 of file ketypes.h. Definition at line 1647 of file ketypes.h. Definition at line 1640 of file ketypes.h. Definition at line 1898 of file ketypes.h. Definition at line 1557 of file ketypes.h. Definition at line 1701 of file ketypes.h. Definition at line 1596 of file ketypes.h. Definition at line 1664 of file ketypes.h. Referenced by GspGetRegisters(), KdbpCmdThread(), KdpGdbEnterDebuggerException(), KiGetUserModeStackAddress(), KiInterruptDispatch3(), KiSystemStartupReal(), KiUserModeCallout(), NtCallbackReturn(), PspGetOrSetContextKernelRoutine(), and thread_to_reg(). Definition at line 1595 of file ketypes.h. Definition at line 1603 of file ketypes.h. Definition at line 1814 of file ketypes.h. Definition at line 1802 of file ketypes.h. Definition at line 1805 of file ketypes.h. Definition at line 1616 of file ketypes.h. Definition at line 1653 of file ketypes.h. Definition at line 1673 of file ketypes.h. Definition at line 1592 of file ketypes.h. Definition at line 1893 of file ketypes.h. Definition at line 1833 of file ketypes.h. Definition at line 1755 of file ketypes.h. Definition at line 1760 of file ketypes.h. Definition at line 1745 of file ketypes.h. Definition at line 1750 of file ketypes.h. Definition at line 1690 of file ketypes.h. Definition at line 1685 of file ketypes.h. Referenced by KeReleaseMutant(), and KeReleaseSemaphore(). Definition at line 1693 of file ketypes.h. Definition at line 1686 of file ketypes.h. Definition at line 1586 of file ketypes.h. Definition at line 1882 of file ketypes.h. Definition at line 1854 of file ketypes.h. Referenced by KiDispatchInterrupt(), KiDpcInterruptHandler(), and QSI_DEF(). Definition at line 1568 of file ketypes.h. Definition at line 1689 of file ketypes.h. Definition at line 1765 of file ketypes.h. Definition at line 1756 of file ketypes.h. Referenced by NtUserBuildHwndList(), NtUserGetGUIThreadInfo(), NtUserGetThreadDesktop(), NtUserPostThreadMessage(), PsConvertToGuiThread(), PsGetCurrentThreadWin32ThreadAndEnterCriticalRegion(), PsGetThreadWin32Thread(), PspDeleteThread(), PspExitThread(), and PsSetThreadWin32Thread(). Definition at line 1751 of file ketypes.h.